Before I get started, did you all watch Timree on “The Real Housewives of Orange County” Tuesday night? Wasn’t she fabulous?!?! And she maintained her composure when Vickie (or as some might say, “Ickie”) was so rude regarding her name. 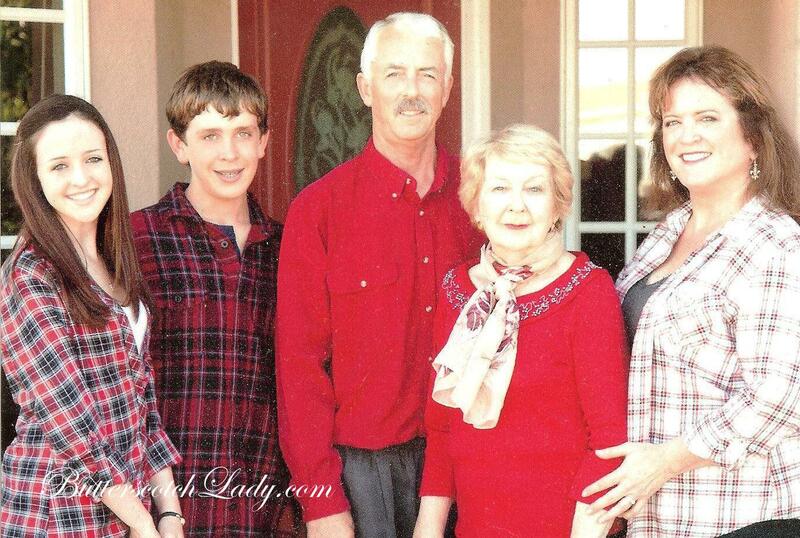 Yes, Vickie, Timree is a REAL name for a REAL lady! Timree has been receiving emails from all over the country and she surpassed 1,000 likes on her Facebook page. CONGRATULATIONS Timree!!! It is not everyday that you know someone who has reached the milestone of 90 years old. I have a great friend Gail, and her mom, Miss Irene, turned 90 years old last month. 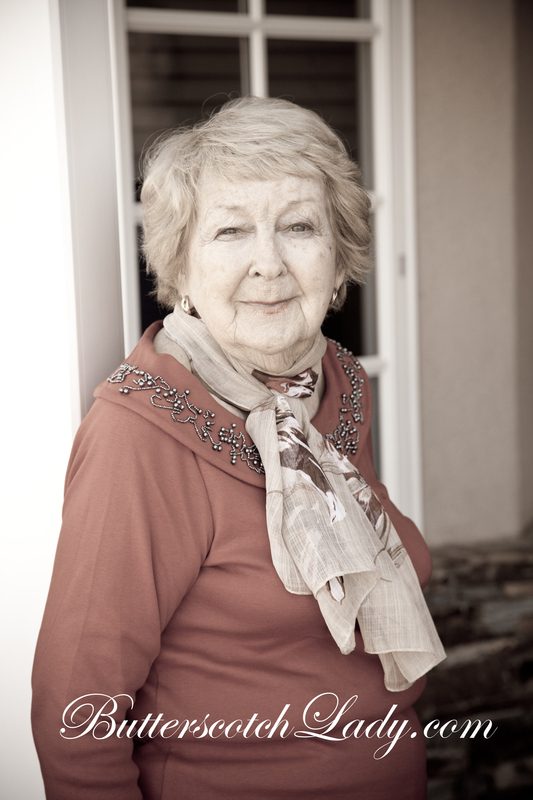 In honor of her 9th decade, Gail and her family hosted a beautiful party in Irene’s honor. It was my pleasure to help Gail style the room for the many friends and family members that had travelled from as far away as Scotland to attend. The colors for the party were red, white and black. About 100 people were expected to attend the party and we knew that the room was not big enough to try and have a seat for everyone. One of my go to options for parties it to rent pub tables. People can stand around them to eat and drink and they do not take as much floor space as a table with chairs would. As many of you know, I do not believe that you have to spend a lot of money on decor to make a party fabulous. Gail borrowed glass bowls and mirrors for the centerpieces and I purchased shredded black paper ($8 for 1 bag) and rosette balls ($2.95 each). 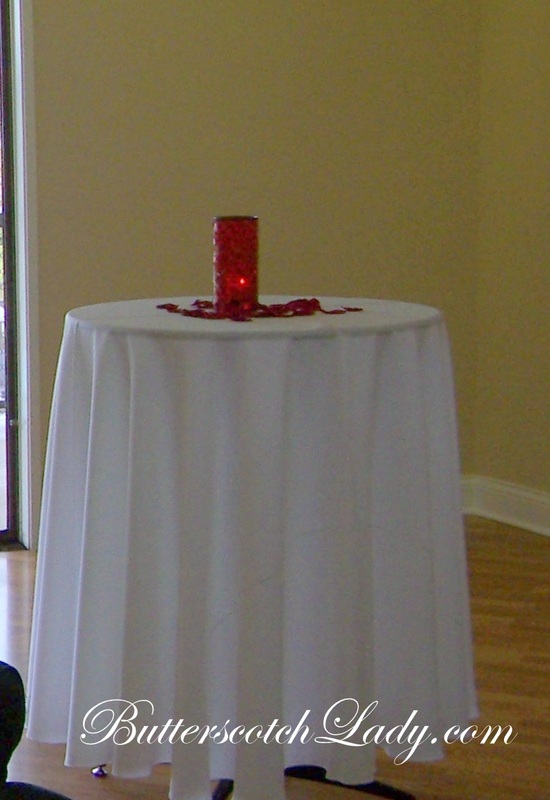 The artificial rose petals were donated by a florist friend of Gail’s. 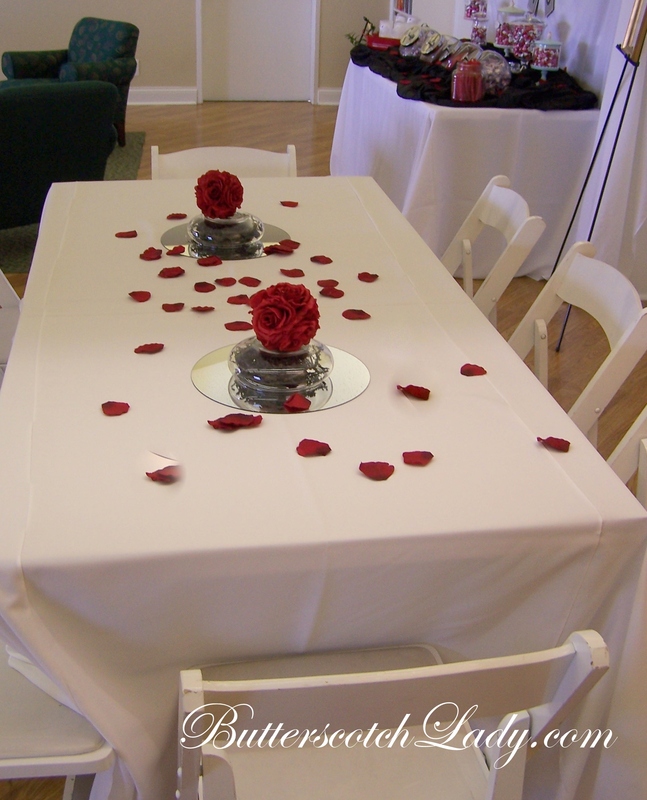 Centerpieces for the tables. I turned the bowl filled with black shredded paper upside down onto the mirror. 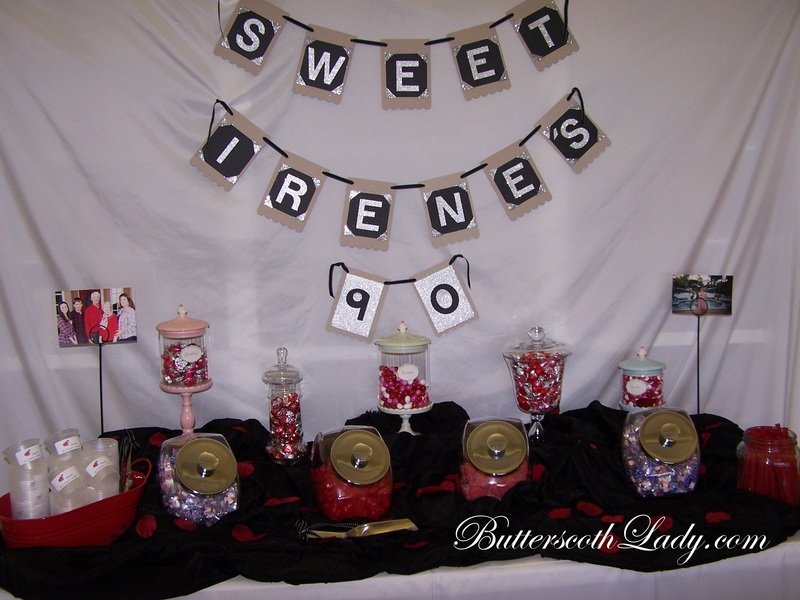 All of the jars were filled with red, pink, white and silver candy. 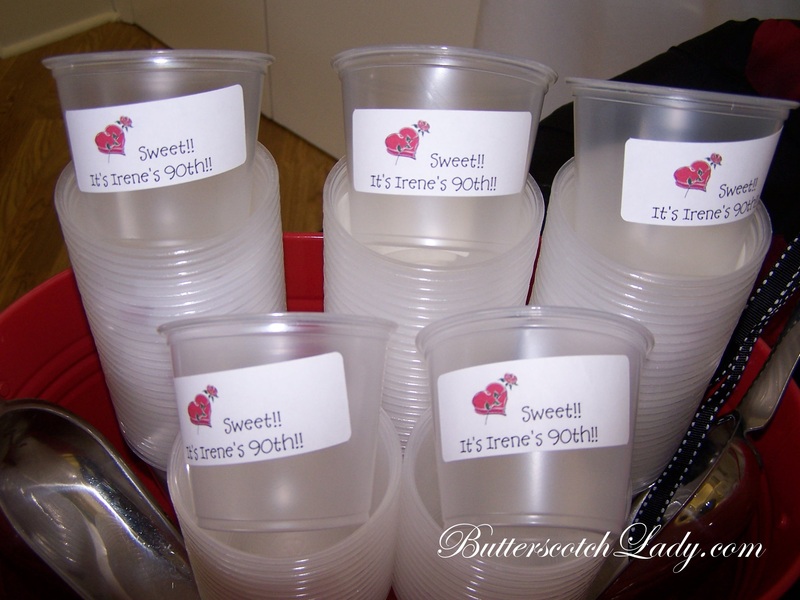 Gail made labels for these little cups for the candy bar. They were the perfect size for the treats. She found them at Smart & Final. And it surely would not be a birthday party without a cake and cupcakes! 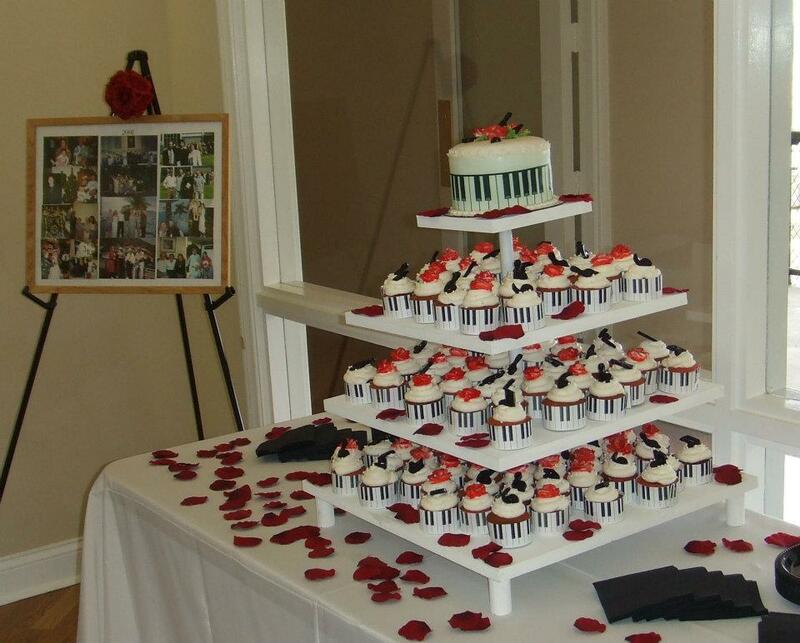 The piano theme was in honor of Irene’s lifelong passion for singing. Gail’s friend Jill Pinson was the fabulous baker that made the cake and cupcakes. Can you believe she does this as a hobby? I would hire her anytime! The cupcakes were absolutely GORGEOUS and delicious! Irene has made picture collages for many years of family and friends. 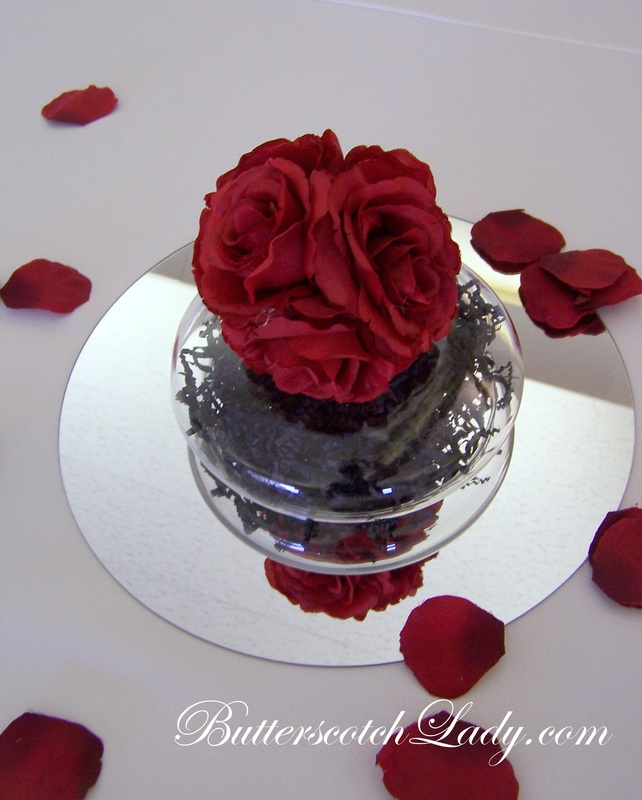 They were perfect for creating a personal touch to her party. Everyone enjoyed looking back over the years of happy (and younger!) times together! I always try to use pictures at parties. The guests feel special when they spot themselves in a picture at the party. Plus, they are a great conversation starter if you happen to be hosting a group of people who may not know one another. Lastly, they are an inexpensive way to add high impact. I just want to say “Thank You” to Gail, her family and most especially Miss Irene, for allowing me to help create a memorable 90th birthday party for her. I can’t wait to plan her 100th!!! HAPPY 90th BIRTHDAY IRENE LILLY!!! And may you have many, many more! « Our Favorite Artist~ Timree! Thanks for the great writeup, Wendy! Truly a day to remember…my mom is still talking about it! Thanks for transforming the room into such a beautiful place on such a small budget!! You are so creative and simply the BEST!! !